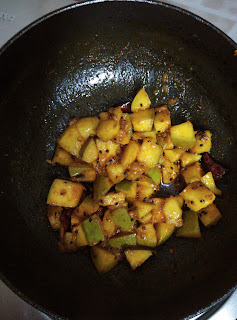 Since my childhood ,I always loved the early days of new mango pickle, as mangoes were still raw and crunchy. Pickle lovers would know, what i am talking about. The love for #aamkaaachar is never dying. But who has the patience to make that a proper storable aam ka aachar, which takes preparation of days or a week. Here is the instant #DIY aam ka aachar recipe which can be stored for a week. It will surely satisfy your taste buds. Once heated, put dry chilly , paanch foran. It must crackle. Once crackled, now put mango, salt and turmeric,heeng. Mix it for a very few seconds and turn off the gas quickly. Remember that, you don't need to cook the mangoes, you need them to be crunchy. Now let it cool down, and serve with dal rice or eat it just like that.